One of my very favorite things to do as a little girl was watch my mom scurry about as she set our dining room table. The dining room always meant a special occasion. Whether it was a holiday, a birthday celebration or the ladies coming over to play cards, the dining room was always dressed in her finest to entertain the guests. I can still hear the doors of the enormous antique hutch pulling open and the old china dishes gently clanking as she would try decide which pattern would best suit her theme of the evening. I find myself doing the very same thing as I set the scene for special occasions. There was something so magical about watching her work. I loved seeing all of the old dishes and glasses that had been passed down for generations and hearing the stories of who had eaten on them before me. I was in awe of the delicate tablecloths and napkins neatly folded in the drawers waiting for their turn to grace the table. Her eyes would sparkle as she gathered the candles and glass globes of all shapes and sizes to use in her centerpiece. watching my mom weave the atmosphere of an evening with her creativity. I guess that must be where my passion for setting the table began. My mom would always have the most lovely of centerpieces. She would retreat to our yard in search of beloved objects from nature to incorporate into her creation. I chuckled at myself as I used a cluster of heirloom pumpkins for my centerpiece while setting a Thanksgiving table the other day. A warm smile spread across my face as I decided to collect some additional leaves to tuck around the pumpkins as little reminders of my Grateful Garland. It’s really such a gift to have memories of watching someone I love take such care and relish so in creating a table for all to enjoy. I feel like I get to relive that feeling each time I set a special table. I had all of my mom’s inspiration in the forefront of my mind as I created the place cards for the Thanksgiving table. 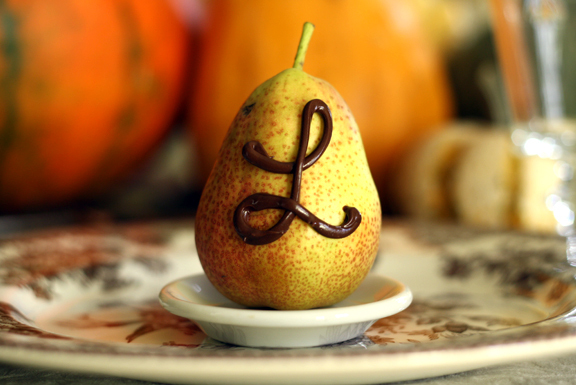 I decided to use pears embellished with chocolate initials to greet each guest. I just melted some semisweet chocolate chips in a microwave safe bowl and poured the melted chocolate into a small baggie. Then gently squeezed the chocolate into a corner of the bag, snipped off the very teensy tip of the bag and piped chocolate initials onto each pear. not to mention edible way to make each guest feel special. And that’s what it’s all about isn’t it? The memories that I cherish most, aside from watching my mom set the scene, are of those special dinners enjoyed with family and friends in our dining room, sitting around those beautifully set tables. It’s all about the gathering of special objects and the love and care woven into a special meal. And, wanna know a secret? I’m not even hosting Thanksgiving this year. I just felt inspired to show those that I love what they mean to me. The little blessings in my life that make my heart complete. We don’t need a holiday to do that do we? Wishing you a Happy Thanksgiving that fills your heart as much as your belly. Wenderly you are loverly! I wanna get together for a weekend of setting the table different ways. Honestly, I like to do it, but I find that I have stopped taking the time to plan ahead to make mealtimes a little extra special. Great ideas as always. So beautiful. I always loved setting the table with my Mama, too. When she opened the door to our formal dining room and started pulling out the linens, I knew she was ready to start a celebration of some sort! great post!! Have happy holiday! You’re so cute. What a pretty table! I don’t have to host Thanksgiving this year… first year ever that we’re headed to a friend’s house for a pot-luck w/ other friends. Happy Thanksgiving! Love those goblets! beautiful setting. Happy Thanksgiving! What a beautiful table setting for Thanksgiving. Can you come over and set my table? Love the place cards – love anything natural on the table. Happy Thanksgiving! 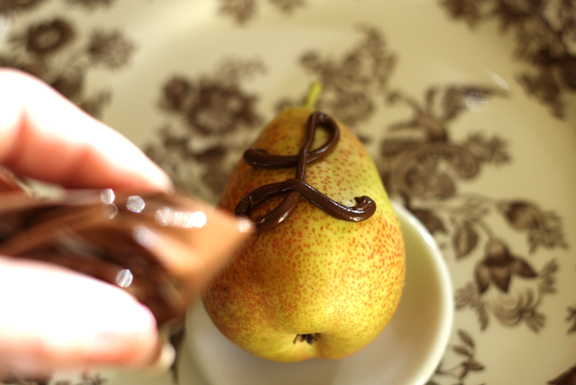 I loved your leaf garland when I first saw it and I adore your chocolate initialed pears. What a charming idea. You do set a lovely table and I know that you set and keep a warm and welcoming atmosphere going for all your guests as well. As much as you love to host, it is nice to not have to be doing it once in awhile and helping out your hostess is a lot of fun too. Enjoy your Thanksgiving, enjoy your family and friends. This is so beautiful, Wendy. I’m in love with those heirloom pumpkins. Happy Thanksgiving to you and yours! What a beautiful setting, love the chocolate & pear “name plates”. 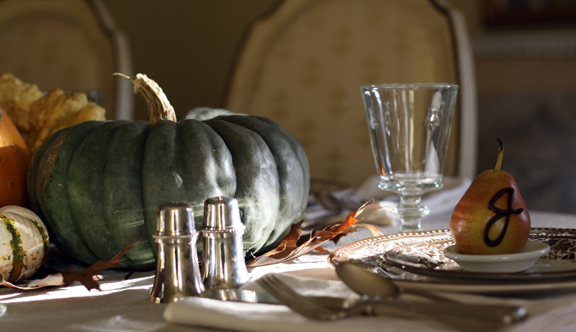 Hope you have a wonderful thanksgiving – so grateful for you and the beauty you bring – cheers! What a gorgeous setting! I love that you kept it simple and au naturale! 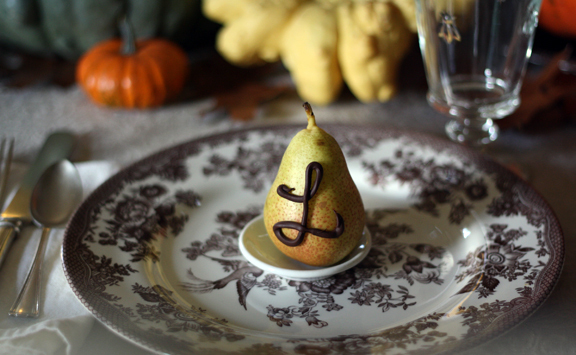 Really lovin’ the chocolate pear place cards! Happy thanksgiving! 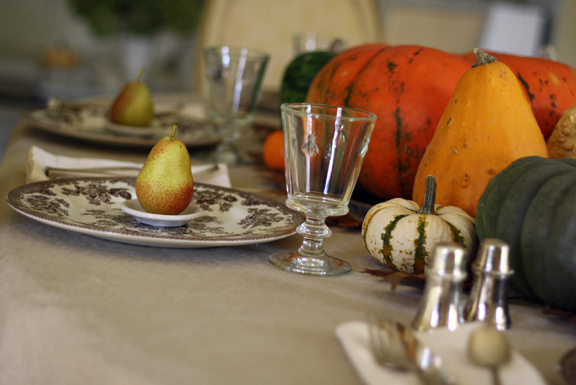 Love the pears as place settings, so simple, clever, and pretty. What a beautiful place card! I love this idea. I swear the pears are yummier this year than I ever remember. So glad to find your blog. Fabulous inspiration here! Just found your blog…and pinning this! I love your table setting but every time I see a beautiful display like this I wonder – Where Do You Put the Food? I’m assuming you don’t have servants.